On this day in 1947, President Harry S. Truman signed into law the National Security Act of 1947, which officially established the U.S. Air Force as a distinct branch of the military. Over the course of its young life, the U.S. Air Force has played a critical role in extending global reach and mobility, maintaining air superiority, and providing crucial combat support to all U.S. forces. American Airmen have fought in major engagements in the Korean Peninsula, Afghanistan, Iraq, Kosovo, and Libya, and they continue today by conducting air strikes against ISIS forces in Iraq and Syria—protecting our forces overseas and our communities at home. Some of the important capabilities the U.S. Air Force provides are strategic deterrence, close air support for U.S. troops, strategic airlift, and aerial refueling for other aircraft of all the service branches. The Air Force rightly prides itself on a “legacy of adaptation, innovation, [and] technological change.” Since its establishment, the Air Force has extended its missions and capabilities into space and most recently cyberspace. Yet despite the fact that its responsibilities have grown in scope and complexity, the U.S. Air Force now flies the oldest and smallest fleet in its history. 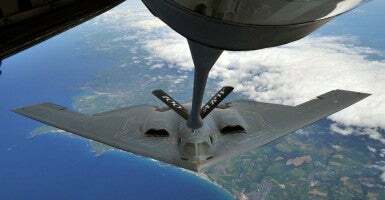 Budget cuts have compelled the Air Force to reduce funding for training, operations, and maintenance in order to preserve key modernization programs needed to revive its aging inventory. Cumulatively, these cuts have resulted in decreased readiness. Simply put, the Air Force is “getting too small to succeed, as opposed to too big to fail,” according to Air Force chief of staff, General Mark A. Welsh III. And to all the men and women of our armed forces, past and present: Thank you for your service and sacrifice.